We often see cars from Ferrari, Lamborghini, Maserati, and many others when walking around Fulham and Chelsea. 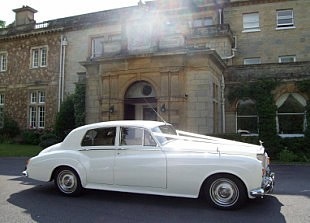 However, today we saw the old Rolls Royce pictured here and the newer Phantom version too. They certainly are nice, and very expensive (around £300,000 for the new ones). I doubt I will ever be able to afford one, or buy one if I could afford it. I’d rather spend my time/money doing something weird, like touring the world on an electric bicycle. 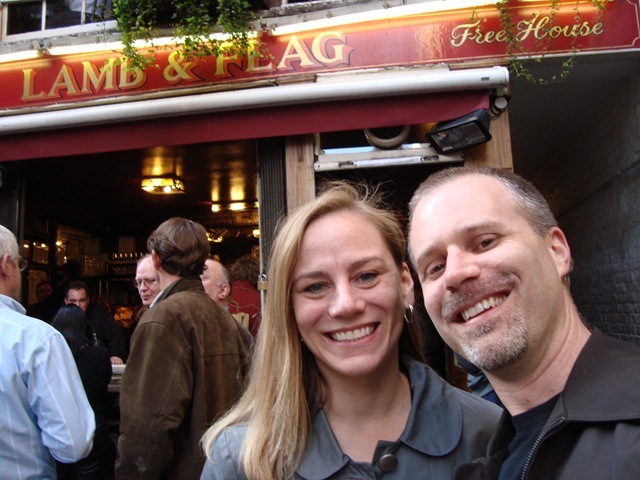 The main reason for choosing this pub was a quest for an old gin bar, as described by Dickens. The fact that it was a warm and sunny Saturday made it all that much better. Since Charles Dickens wrote about this neighbourhood when explaining gin, I figured the oldest pub in this neighbourhood in London was an appropriate place to try. While it does have some charm, the pub really isn’t all that. Yes, we had a G&T with Bombay Sapphire, but it was a bit crowded and with no good music to keep us entertained, we soon moved on. Still though, it was an interesting place worthy of the visit. Milo and I started our Easter Sunday at 6:45am so he could take care of business before catching the first train of the day. As it turns out, the first train isn’t at 7am from Fulham Broadway as promised and the first train to come by doesn’t stop. However, by 7:30 we were in Victoria ready to continue “Milo’s Tour of London”. I have been trying to capture Milo in front of iconic images of London, so I figured getting going before most people in London get up (on a Sunday anyway) would be good. We walked up to Buckingham Palace, down The Mall next to St. James’s Park, then over to the Cabinet War Rooms where Churchill hung out during WWII. 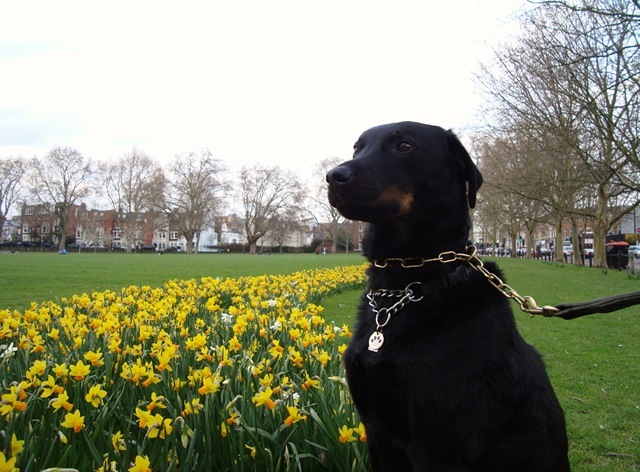 Then came New Scotland Yard, Westminster Abbey, and while getting the picture of Big Ben, a cop asked if Milo was friendly. They quickly became good friends. We then meandered a bit from Trafalgar Square to St. Paul’s Cathedral, the Tate Modern museum and Shakespeare’s Globe Theatre past the Clink Prison and through Borough Market, but it wasn’t operating today. We then hit our turning around point: The Tower Bridge and the Tower of London, which means we also saw City Hall, the graffiti covered Southbank skateboard park (they leave it that way instead of repainting it all the time). We eventually made it to the London Eye, past the other side of the Houses of Parliament with Big Ben, down to Battersea with the power station and park. Finally we made it back to our neighbourhood with the houseboats in Chelsea, the football club, and finally saw a clean black taxi with no ads and sitting still. We were gone 6.5 hours and walked a total of 14.3 miles with only one real stop to share an apple for about 10 minutes. I made a quick map here if you want to see the route along with all of the iconic London pictures with Milo. Friday night I went to Ronnie Scott’s, which is a famous Jazz club here in London. 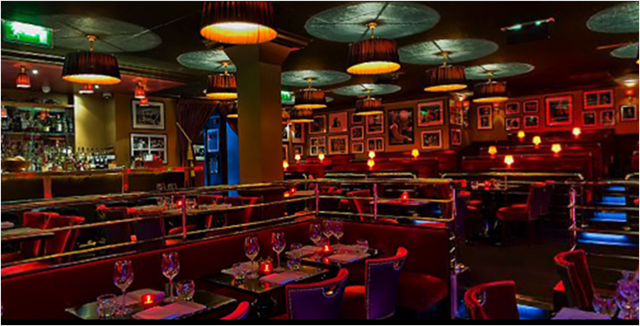 I really don’t know much about Jazz, but I find it entertaining enough and Ronnie Scott’s is a cool club to people-watch. It was just Anne and I since sitting in a club listening to music isn’t really Lorie’s thing. The guy in the first photo was the main act for the night. 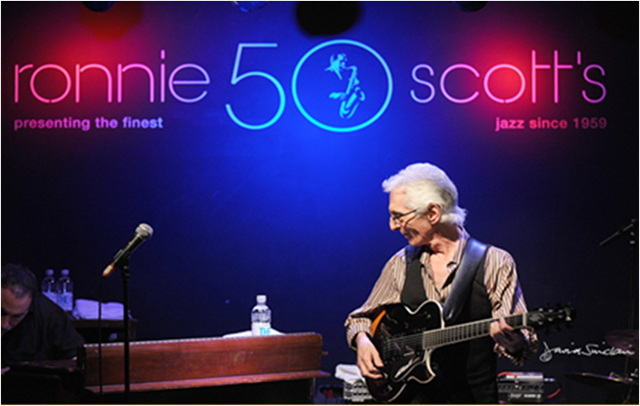 He is Pat Martino on guitar with Tony Monaco on keyboard and Lois Tsamous on drums. Pat told a story of hanging out in New York and learning from Les Paul, who basically invented the electric guitar. The club is in Soho and is packed in with all the other clubs and theatres in the area. It has been there since 1959, which would be considered a long time in the US, but the nearby Dog & Duck pub is 275 years old. The only thing these two photos have in common are the time of year. The time that England goes crazy for any form or chocolate egg and tulips daffodils bloom. I eat the chocolate and Milo pees on the flowers, so we’re both happy. The chocolate egg craze is in full swing with Easter coming this weekend. They are usually hallow and everyone makes one: regular candy bar types, specialty chocolate shops, and even TV shows. 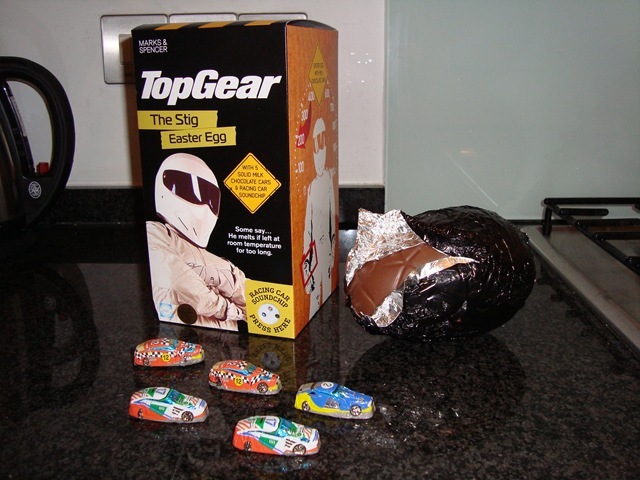 This one is for Top Gear and the guy on the box is called The Stig.